Meow all fur friends and humans big and small. It’s Holly here again because I have some very special news and possibly a very short tale (not my tail of course it’s not short at all) Is everyone ready with their favourite mice and bag of treats for me to continue? 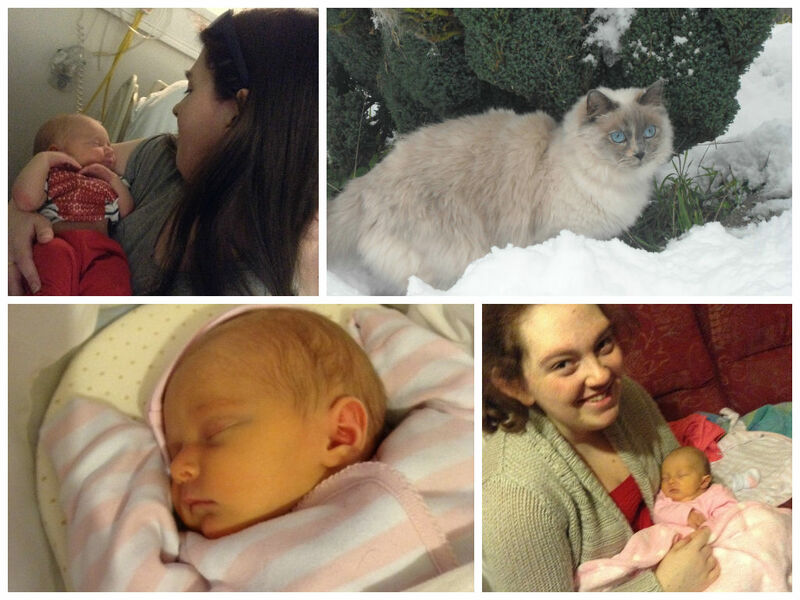 News of the week is; my human became an Aunty to little Roseanna, she was born on September 30th 2014. My human told me that means I have a new playmate to purr at and snuggle when she’s bigger. Then we watched a film about fairies that seemed to be giving the baby wishes. It got my cat blogging mind tingling and here I am under the bed after stealing my humans laptop and her fairy wand from her Christmas dress up days. I’m going to cast purrfect magic with my little furry Fairytale tale. Once upon a blogging Thursday night. Holly (that’s me) stole a wand and laptop and hid under a huge bed. After hours of thinking about the humans downstairs and seeing them all gathered around a white basket with a strange teddy at the bottom. Holly remembered the magic film she had watched and how the humans reminded her of that moment in the magic film. Holly picked up the wand in her mouth and ran down the stairs with it. Her heart felt light and her fur tingled with a magic she had never known before. As she reached the bottom of the long stairs the words needed to transform the humans in the next room came into her furry mind. She purred and purred as she reached the living room and by passed Jessie the dog, who was sleeping calmly in her bed not too far away from the humans. Holly pawed passed them all, shaking her head while muttering. “Magic wand I stole from thee turn the human’s into blessing fairies.” Silver and pink sparkling glitter flew off the wand and hit each human, cat and dog as she pawed passed them. After every one had sparkles on their clothes Holly quietly walked to the door and watched as all the humans grew wings and held one little blessing for Roseanna in their hearts. Jessie the dog stood up and walked over to the basket, And in a loud barking voice she said. “I bless Roseanna to love dogs over cats,” Holly rolled her eyes what a thing to say? she thought as Smokey fluttered passed looking more scared than a cat that had been caught stealing Dreamies. He stopped, and looked down at Roseanna. Holly listened hard as Smokey muttered. “Make everyone that reads this, blessing fairies, so they can bless her too,” Holly felt unsure if it would work, but a believer in her own magic and that she had learned enough from fairytales to know that it should work. Holly put the wand back under the fairy outfit and dragged the laptop back on to the bed. She pressed send as she fell asleep on the laptop and dreamed of all the blessing she had now sent out to Roseanna. ← Ten Question To Answer-For Fun! Thanks Hun, I hope your week has been great. Your little niece is gorgeous! Congratulations! Holly’s story made me feel inspired for the day! I hope you’re well and having a lovely week. Thanks for reading it, I feel like a more magical cat now. 🙂 I’m sure she will. Thanks Hun I hope you, Othello and Cleo are well.